iPage makes hosting easy for almost anyone, yet it provides powerful features backed by superior support. Beginner webmasters should begin their hosting search here, but don’t discount it if you’re already experienced. 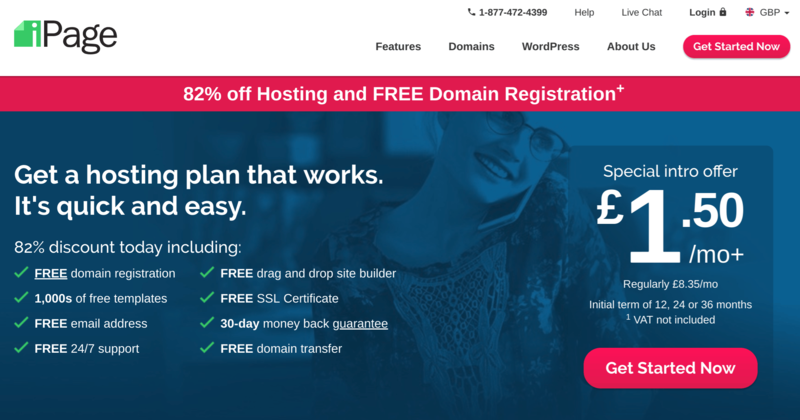 iPage offers a simple set of hosting products with low introductory prices and a money-back guarantee, making it a good option for anyone who is new to hosting. In this review I’ll point out iPage’s pros and cons and assess how these will affect your hosting experience, to see if this vendor’s hosting services are as good as the vendor says they are. Since setting up in 1998, U.S.-based iPage has grown steadily to now host more than a million websites for customers around the world from two world-class data centers in Boston, Massachusetts. This is not a one-size-fits-all hosting provider. Its somewhat simple set of shared hosting, WordPress hosting, VPS, and dedicated server products won’t suit everyone. A first look at iPage’s pricing also makes me wonder if it’s too good to be true. Spoiler alert: it is too good to be true! Since iPage is an Endurance International Group (EIG) brand, and the parent company has been criticized for past performance, I’ll be looking to see if iPage performs any better. And as I take you step-by-step through the registration process, I’ll identify the potentially costly traps that you’ll want to avoid. iPage provides a number of integrations with popular platforms and suites that will help you improve your performance and security. iPage seems to have all the hosting essentials pretty much covered, especially for beginner webmasters who should be able to set up a complete hosting solution from nothing. You can secure your site with SSL and SiteLock security, get daily backups as a paid add-on, and reach your website readers efficiently thanks to the optional CDN. And you can begin building your website using WordPress, Weebly, or iPage’s homegrown website builder. Let’s look at some of the features in detail. SiteLock is a suite of tools to provide performance and security enhancement essentials for any website. 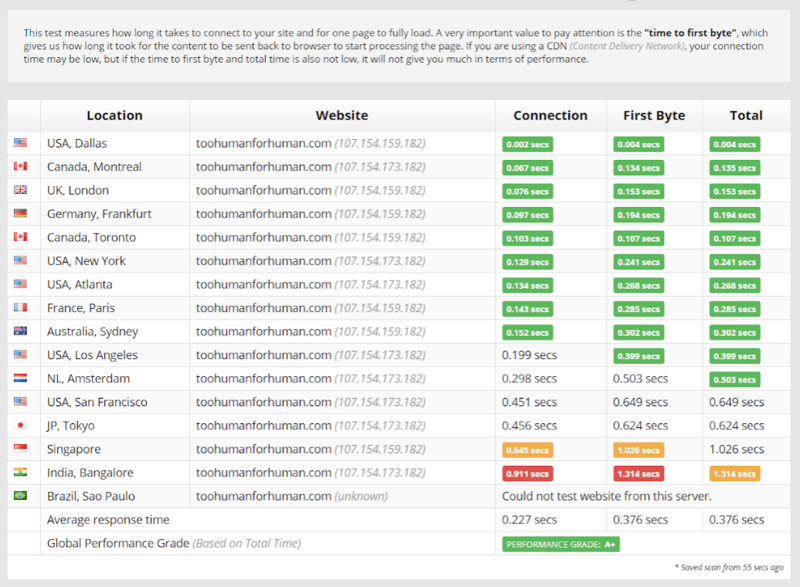 It scans for malware and vulnerabilities and blocks automated bot attacks. It provides a firewall and a CDN. iPage’s “WP Essential Plan” (for WordPress) includes a custom version of the SiteLock security suite for free. You’ll be given access to your own SiteLock dashboard where you can view website statistics and even set up a SiteLock security badge to display on your website. You can also engage the services of a security professional to clean up your hacked website (for a fee) through the ‘SiteLock911’ service. To help you get your website started, iPage provides a number of pre-installed WordPress plugins including the Jetpack plugin that gives you access to over 100 free WordPress themes, plus lazy-loading images, brute force attack protection, downtime monitoring, statistics monitoring, and much more besides. Other plugins include the W3 Total Cache plugin (which is one of the top caching plugins) and the Mojo Marketplace plugin (which lets you buy additional themes and plugins). iPage has a basic version of Google Analytics built into the dashboard so that you can quickly see visitor statistics such as where your visitors came from, over what time period, and how they interacted with your website. You can also easily activate additional analytics tools such as AWStats or Webalizer. iPage provides Roundcube email hosting with its shared hosting and WordPress hosting plans. You only get 500 MB of email storage by default, but you can buy credits for more email storage. Your email comes with all the essential features including IMAP/POP3 support, SSL, and autoresponders, plus setup steps for email clients such as Outlook and Gmail. You’ll also get Constant Contact email marketing campaigns free for three months. The WordPress Sandbox provides a way to test changes to your website without affecting the current live version. 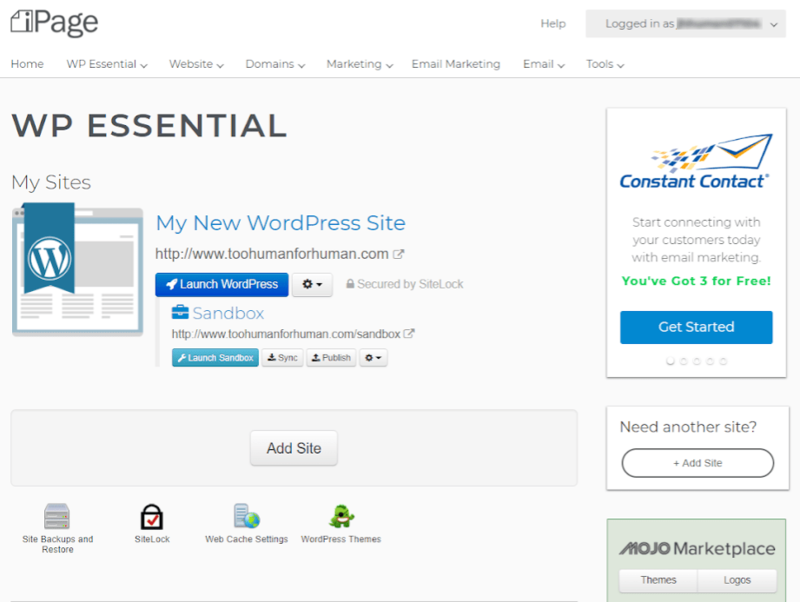 A copy of your website is saved to your local hard disk so you can install plugins, change the theme, or adjust your settings with no adverse effects. When you’re happy with the changes, you can push them to your live site. iPage’s simple user experience puts ease-of-use before everything else (even design). iPage aims to be accessible to as many people as possible. 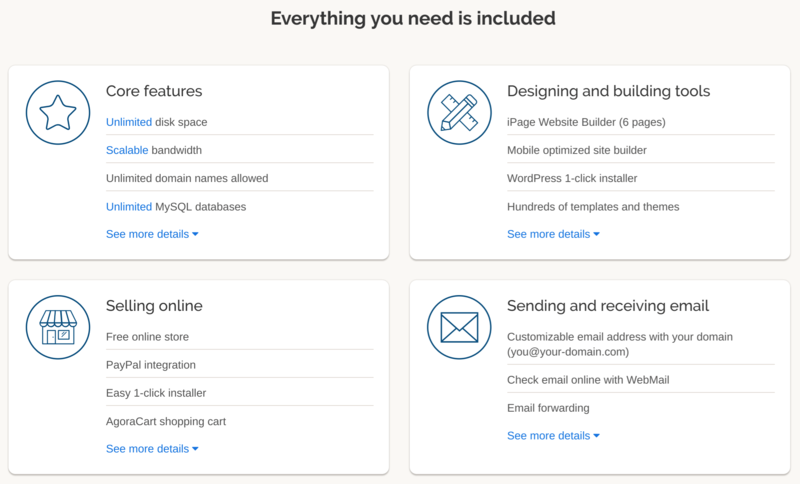 It mostly gets this right by being easy to use, right from the registration process all the way up to setting up your first WordPress website via the simple hosting dashboard. iPage provides a variety of tools to build your website. You can use WordPress or another CMS, Ecwid for an e-commerce store, the Weebly website builder, or iPage’s own drag-and-drop website builder. As a new webmaster, you could find complicated control panels like cPanel and Plesk confusing. That’s why iPage provides its own management dashboard that makes it easy to manage the most important aspects of your hosting without being overwhelmed with information. While it provides easy navigation to essential hosting features, the dated dashboard could definitely do with a design overhaul. iPage provides very simple setup wizards to help ease you into the process of setting up your site. These onboarding wizards are tailored for each of the website building platforms. For example, the WordPress wizard can generate the first few pages and provide you with prompts to start setting up your website. Creating an iPage account is an easy process with few unnecessary steps apart from an unexpected questionnaire and an unnecessarily long password creation step. I completed the end-to-end experience in about 7.5 minutes, which is good but not great. It involved only one email exchange, and there were no nasty hidden costs, secret prices, or pre-checked additions. See my signup steps here. Connecting my domain and installing WordPress was a slightly bumpy ride for me, but it might not be for you. Installing a WordPress website the first time was a bit confusing, and my Jetpack plugin installation was delayed by a one-off blocking issue. It was frustrating for me, and it took me 20 minutes (including a support call) before I could begin building my site. However, if it all runs smoothly for you, then you can look forward to having your WordPress website up and running in as little as 15 minutes. See how I installed WordPress and connected a domain. iPage is super-fast in some locations, and actual uptime exceeds the provided guarantee. iPage offers an industry standard (and not particularly exciting) 99.9% uptime guarantee for all its hosting products. On the plus side, this company’s existing customers report an actual uptime as high as 99.98%. The good news is that the overall performance achieved an A+ grade, but this blended metric doesn’t tell the full tale. You can see that the Dallas, Montreal, and Toronto times were 0.004, 0.135, and 0.107 seconds respectively. Other North American locations such as Los Angeles were somewhat slower at 0.399 seconds, and European locations like London and Frankfurt were surprisingly fast. So far, so good, but the real shockers were Singapore and Bangalore, so you should carefully consider your target markets before signing up. One of the best aspects of iPage’s hosting is the diligent support staff who are never more than a few minutes away. iPage provides 24/7 technical customer support with all of its hosting products, and it provides “managed support” with its VPS and dedicated server solutions. 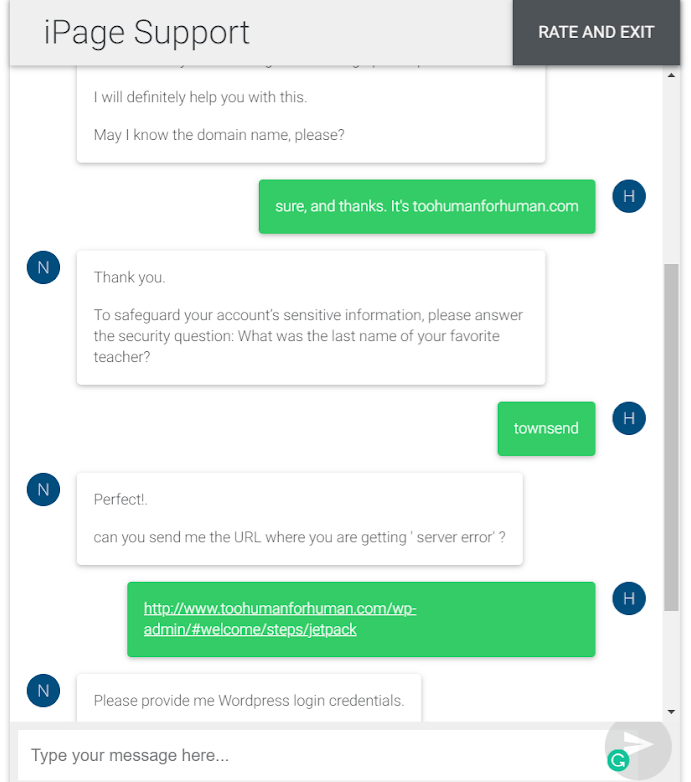 Although this company suggests that its support services are offered via live chat, telephone, and a ticketing system, I couldn’t actually find the ticketing system that I presumed to be behind the client login page. I tried the live chat, I liked it, and I’ll say some more about it. But first, I should say that this provider also offers extensive documentation that includes tutorial videos. As I couldn’t call the advertised phone number from my country, I made much use of the live chat support, and it didn’t disappoint. Every time I tried, I was connected almost immediately to a courteous support agent who satisfactorily answered all my questions. To initiate a live chat, you first have to fill out an online form. Then you can continue with your questions. My first query was about when I first signed up for iPage, and I was confused about my iPage account password and my WordPress admin password. It also seemed that the “reset password” links didn’t work. 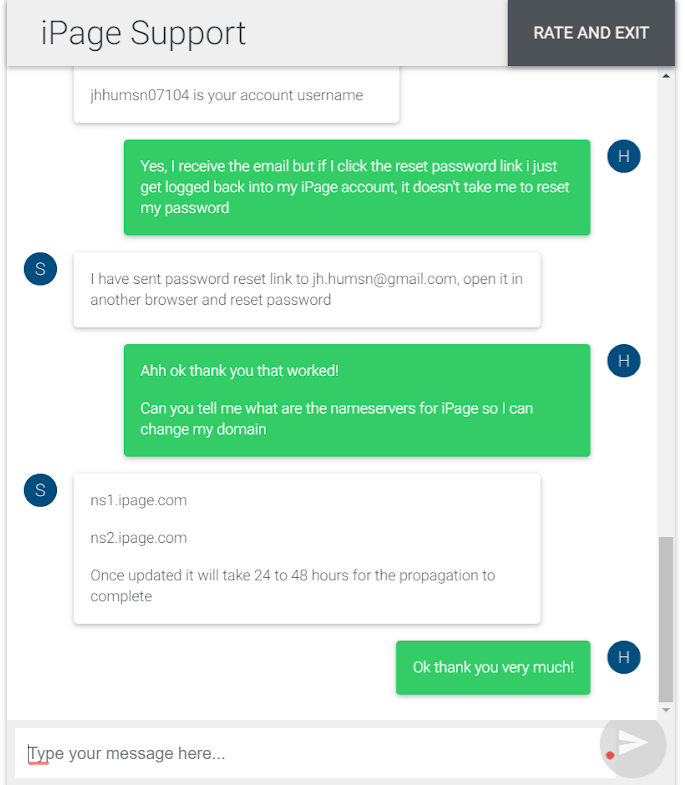 I’ve been extremely impressed by my interactions with the iPage support team. Two of my questions were even answered on Christmas Day, which would be a non-working day in many parts of the world. Of course, I gave good feedback when I was invited to fill out the subsequent customer satisfaction survey. iPage offers almost unbelievably low introductory prices, but watch out for the high renewal rates and paid add-ons. For all shared hosting products, iPage’s incredibly inexpensive pricing includes unlimited storage and bandwidth, free SSL certificates, and a free domain name. VPS and dedicated server prices are in line with industry averages, and the WP Essential plan includes SiteLock security for free as added value. You can pay using pretty standard payments methods such as credit/debit cards and PayPal. Web hosting customers also get $100 worth of Google Ads and Bing advertising credits, with the caveat that you only get the $100 when you first spend $25. While iPage almost always entices you in with “special offers” (so are they that special? ), these come at the cost of high renewal rates of up to four times the original charges. In the long run, you might pay more than you would with an initially higher priced competitor. As with other hosting providers, iPage’s promise of “unlimited hosting” is actually subject to its “acceptable use” policy that limits the number of files you can store if they start to affect server performance. iPage offers a 30-day money-back guarantee with all its hosting products, which should give you some confidence about committing to the company. But beware that the refund process isn’t perfect: you need to talk to support, and its email communications are not exactly clear about how and when your refund will be processed. My refund was processed efficiently enough once I had requested it, with the only caveat being that the agent asked me if I’d like to sign up for another type of hosting instead. Depending on your viewpoint, this could be perceived as helpful (“How can we serve you better?”) or as an annoying upsell. You retain up to 48 hours access to your account before it is closed, and I’m pleased to say that I received my refund within 48 hours too. onClick="trackClickout('event', 'clickout', 'Vendor Page - Visit User Reviews', 'iPage', this, true);"
iPage provides admirable performance and support, but with slightly sharp pricing practices and a minimally functional interface. I can best sum up iPage by saying that it makes hosting easy for almost anyone, including beginner webmasters, thanks to its home-grown simplified control panel. Yet this provider still provides powerful features, and all plans come with superior live chat support. The bottom line is that iPage is best suited to beginner and intermediate webmasters with small to medium websites. Wondering how iPage stacks up against other Web Hosting companies? Enter any other Web Hosting company and we will give you a side-by-side comparison.